Own “Kong: Skull Island” on Ultra HD Blu-ray, 3D Blu-ray, Blu-ray and DVD on July 18 or Own it Early on Digital on June 20! 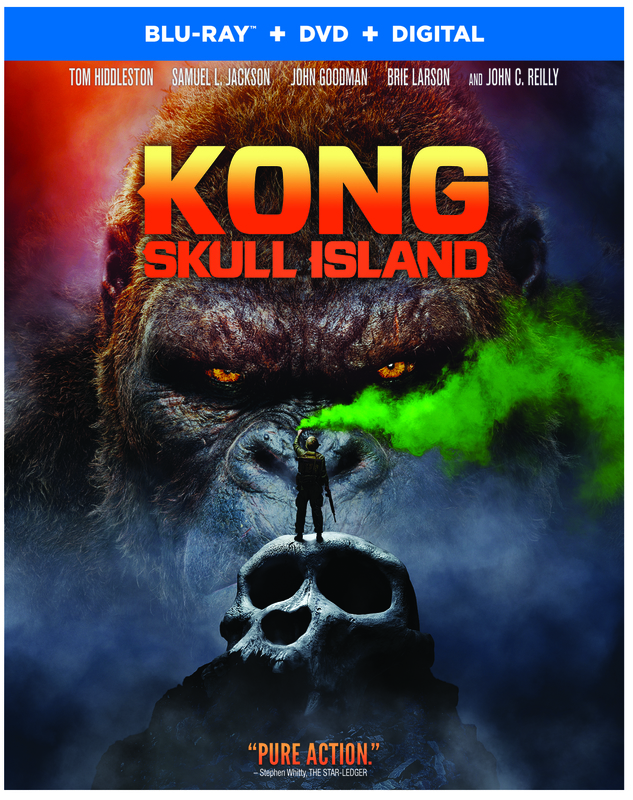 Burbank, CA, May 24, 2017 – See the origins of one of the most powerful monster myths of all when “Kong: Skull Island” arrives onto Ultra HD Blu-ray Combo Pack, Blu-ray 3D Combo Pack, Blu-ray Combo Pack, DVD and Digital. This compelling, original adventure from director Jordan Vogt-Roberts (“The Kings of Summer”) tells the story of a diverse team of scientists, soldiers and adventurers uniting to explore a mythical, uncharted island in the Pacific, as dangerous as it is beautiful. “Kong: Skull Island” stars Tom Hiddleston (“The Avengers,” “Thor: The Dark World”), Oscar® nominee Samuel L. Jackson (Best Supporting Actor, “The Color Purple,” 1994, “Pulp Fiction,”), John Goodman (“Transformers: Age of Extinction,” “Argo”), Oscar winner Brie Larson (Best Actress, “Room,” 2015) and Oscar nominee John C. Reilly (Best Supporting Actor,“Chicago,” 2003). Vogt-Roberts directed the film from a story by John Gatins and Dan Gilroy and a screenplay by Dan Gilroy and Max Borenstein. “Kong: Skull Island” is produced by Thomas Tull, Mary Parent, Jon Jashni and Alex Garcia, with Eric McLeod and Edward Cheng serving as executive producers. 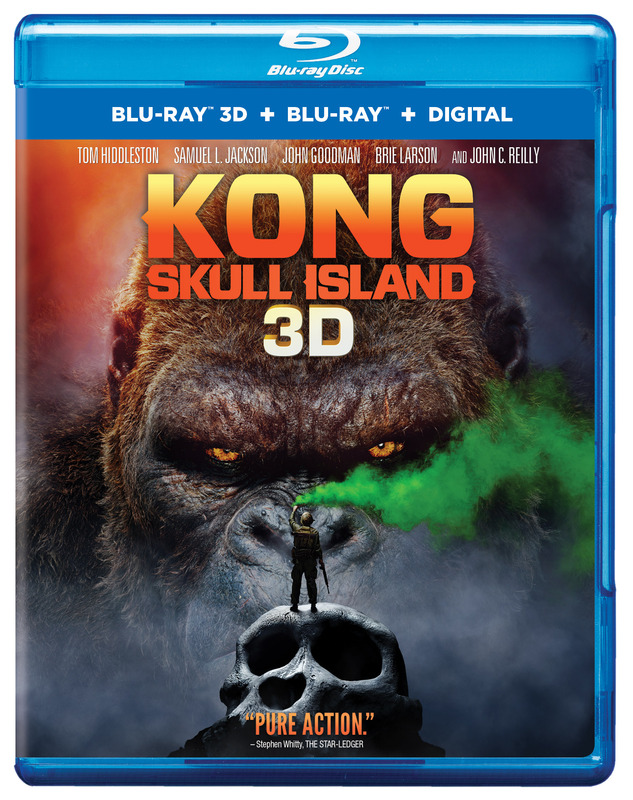 “Kong: Skull Island” will be available on Ultra HD Blu-ray Combo Pack for $44.95, Blu-ray 3D Combo Pack for $44.95, Blu-ray Combo Pack for $35.99 and DVD for $28.98. The Ultra HD Blu-ray Combo Pack features an Ultra HD Blu-ray disc with the theatrical version in 4K with HDR and a Blu-ray disc also featuring the theatrical version. The Blu-ray 3D Combo Pack features the theatrical version of the film in 3D hi-definition and hi-definition; the Blu-ray Combo Pack features the theatrical version of the film in hi-definition on Blu-ray; and the DVD features the theatrical version in standard definition. The Ultra HD Blu-ray Combo Pack, Blu-ray 3D Combo Pack and Blu-ray Combo Pack include a digital version of the movie. Fans can also own “Kong: Skull Island” via purchase from digital retailers beginning June 20. 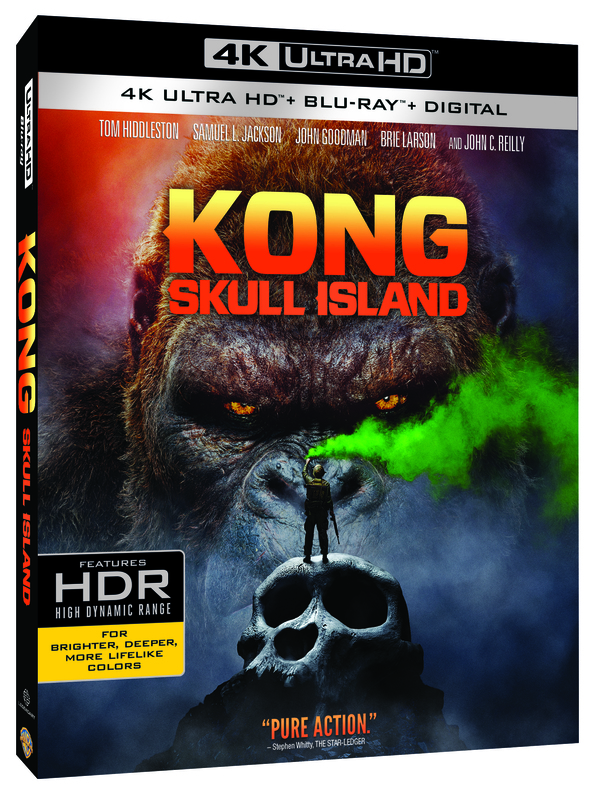 The Blu-ray discs of “Kong: Skull Island” will feature a Dolby Atmos® soundtrack remixed specifically for the home theater environment to place and move audio anywhere in the room, including overhead. To experience Dolby Atmos at home, a Dolby Atmos enabled AV receiver and additional speakers are required, or a Dolby Atmos enabled sound bar; however, Dolby Atmos soundtracks are also fully backward compatible with traditional audio configurations and legacy home entertainment equipment. On June 20, “Kong: Skull Island” will be available to own for streaming and download to watch anywhere in high definition and standard definition on favorite devices from select digital retailers including Amazon, CinemaNow, FandangoNow, iTunes, PlayStation, Vudu, Xbox and others. On July 18, “Kong: Skull Island” will be made available digitally on Video On Demand services from cable and satellite providers, and on select gaming consoles.